← I forgot to Zero Out my Camera! 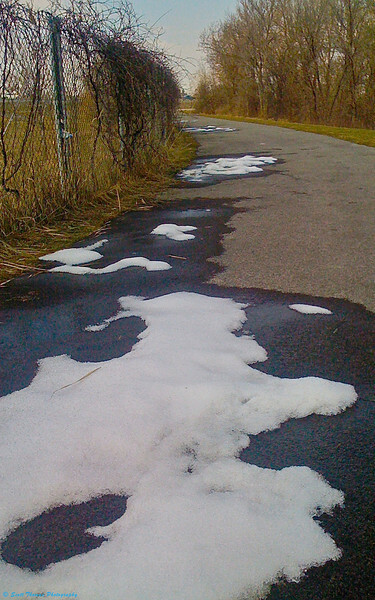 Snow melting away on the path used for the blog author's lunch walks. Taken with the Apple iPhone 3G. Two days before I took this photo, the path was 90% snow covered with just enough clear on one side to walk. Two days of sunny and warm weather later, it’s only 10% covered in this stretch. There’s a part which still had six inches of snow on it. Should be gone by the time of my next lunch walk. This entry was posted in Weekly View and tagged 3g, apple iphone, exercise, lunch, melt, Photography, snow, spring, walk. Bookmark the permalink. Scott, it looks like spring is just around the corner, I’m looking forward to that. Weather guy said this morning this week should be snow free with warm temperatures. Looking like the end of March might hold some colder weather. Will enjoy it while I can this week. Oh, nice! Continents emerging and subsiding . . . and all on an iPhone. Proof that a person doesn’t have to have an elaborate camera to make a strong image. Here in Western Mass., we’ve been treated to temps in the 60’s – seems strange to see snow still around at all! You’re in NY state, right? This was taken last week, Karma. The snow is all gone now. Did you take a quick trip to Denmark? Looks exactly like here. I absolutely agree about “the best camera” statement. Wish I had been in Denmark, Birgitte. Don’t worry, if I am ever there, I’ll be sure to contact you about it.